Sonic the Hedgehog 175 is the one hundred and seventy-fifth issue of the Sonic the Hedgehog comic series and the seventh mile-stone. It was released in May 2007. 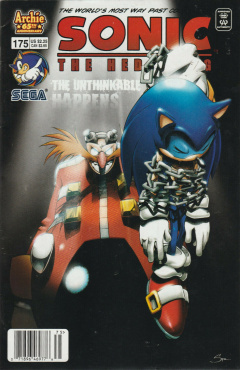 This comic features only one story: "Eggman Empire". Sega allowed Ian Flynn to have Eggman beat Sonic as long as Sonic has a quick come back. Before Eggman attacks the Freedom Fighters are seen playing a GameCube. This page was last edited on 29 October 2018, at 16:32.